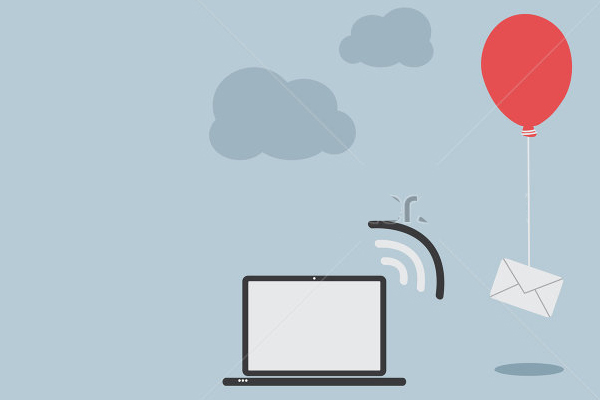 This analysis relies on traditional marketing techniques like awareness & reinforcement – contributing to final purchase after many impressions, clicks & visits. 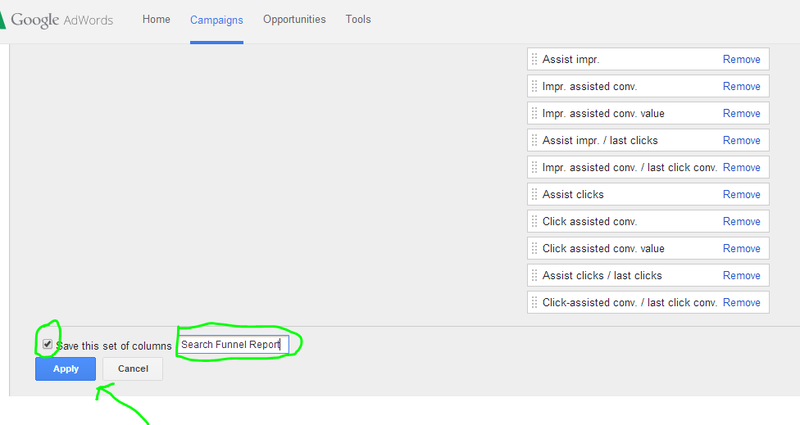 The Search Funnel Analysis identifies these Awareness & Reinforcement contribution of these keywords – using terms like Impression Assists & Click Assists. Let us see how we can build a quantitative model to leverage traditional marketing approach in standard adwords optimization. 1.This is how we would create the Search Funnel report and build it for conversion rate optimization. 2.The second step is to click on “Columns” in the Keyword Report and select “Customize Columns”. 3.The third step is to add columns to the report from the Customize Columns section – need to choose the Search Funnel under Select Metrics and then add all the columns to the report. You can customize the column order as above, name the report and apply the changes. The parts that we are most interested in are bounded in red. Standard optimization techniques would consider CTR, CPC, Conversion Rate and Conversion Costs. However we will be looking at the new search funnel metrics along with Average Position & Converetd Clciks – for advanced optimization. The logic used here is from Marketing as opposed to AdWOrds per se – although we will be using AdOWrds & Analytics data to make the optimization choices. Let me take a simple example here. In the above scenario, keyword 2 will get credit for the transaction. However since keyword 1 brought the brand in front of the customer at an earlier stage, it is considered to have played a role in the conversion as well – called as Impression Assisted Conversion. The impression from “Keyword 1” was in the path of Search to Visit to Conversion process and is considered to have assisted the final conversion. An Impression Assisted Conversion is counted only when the impression (without ad click) from Keyword 1 contributed to a conversion – through a click from an Ad impression shown when Keyword 2 was searched for (not “keyword 1” again). This “keyword 2” can be from the same campaign or a different campaign. In the above scenario, keyword 2 will get credit for the transaction. However since keyword 1 brought the customer to the website at an earlier stage, it is considered to have played a role in the conversion as well – called as Click Assisted Conversion. A Click Assisted Conversion is counted only when the click (without a purchase) from Keyword 1 contributed to a conversion – througha click from an Ad impression shown when Keyword 2 was searched for (not “keyword 1” again). This keyword 2 can be from the same campaign or a different campaign. Here is an example for Impressions Assist – I search for an air ticket with the search term “flight ticket from Chennai to Mumbai” and see an ad for Spice Jet. However I do not click on it. Next time I could search using the term Spice Jet, land on the site and purchase a ticket. Obviously the first search term “flight ticket from Chennai to Mumbai” introduced me to the brand and enabled a conversion during the next search. Similarly here is an example for Click Assist, I could click on the Spice Jet Ad when I used the search term “flight ticket from Chennai to Mumbai” and visit the website the first time – however I did not complete a tranaction. Next time I could search using the term Spice Jet, land on the site and purchase a ticket. Obviously the first search term “flight ticket from Chennai to Mumbai” introduced me to the website, services & pricing and enabled a conversion during the next search. Given that Impression Assists and Click Assists are common in many medium and large sized accounts, let us see how we optimize using advanced techniques. Step 1: How do we credit keywords that contribute to impression & click assists? Would you value a click assist more than the impression assist? One way to do this is to approximate # of impression assists to one conversion – say if it takes seven impressions before a searcher becomes a customer, we can approximate impression assit to 1/7th of a conversion (0.14). Similarly if it takes 3 clicks on an average before an adwords visitor transacts on the website, we can allocate 1/3rd of a conversion credit to Click Assists. The metrics required for the above weightage calculations are available in Google Analytics & AdWords. So in this specific exercise let us assume Impression Assists carry 10% conversion value and Click Assists carry 25% conversion value. 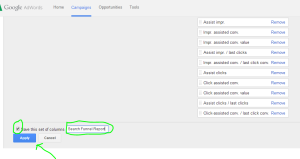 I am now creating additional columns in the Search Funnel Reports – to account for these notional conversions. a. existing Search Impression Share – can I spend for more impressions? b. existing average ad position (below 2.5 or above 3?) & position (Top or Other) – can I spend for additional clicks? 3.All things above being equal, we can prioritize by comparing engagement metrics imported from Google Analytics – bounce rates, pages per session and micro conversions. Based on the above rules, we can prioritize keywords that offer the maximum conversion & costs benefits along with the ability to handle additional spends. For example, a keyword with 40% variance in conversion costs is attractive, but if it is already at 95% impression share and ad position of 1.2, there is no leverage gained by additional spend – it is already maxed out. It is also important to remember that these are iterative. The above report is just a starting point and we need to monitor performance of these keywords on a weekly basis – once the bid changes are applied. There are other reports that can be reviewed for optimization – by Device & Paid vs Organic reports. Will review them later.